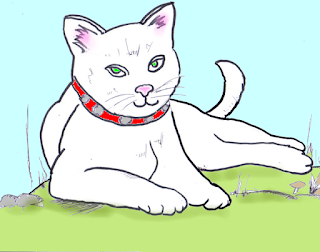 Juno's Diary "Life through my eyes"
White cat Juno writes his life in both Japanese and English. Once upon a time, a couple lived in a village. One day, as usual the man went in the woods to get sticks for firewood and the lady went to the river to do laundry. When the lady reached the river, she noticed a big fallen tree nearby. She thought, 'It must have been downed by the typhoon that had come through. It could be good firewood.' After she did laundry, she went to the woods to call her husband. "Hey Dear, I found a big tree that has fallen down. Why don't we use it for firewood?" "Okay, I'll chop and dry it now," the man said and began cutting the big tree with an ax. Surprisingly a white kitten meowing jumped out from the tree! "Oh my goodness! A cat was in the tree! That was close… It was lucky not to be cut by the ax." "So adorable! I was wondering why this kitty was in the tree," the lady lifted the baby cat in her arms. The couple decided to raise the kitten in their home. 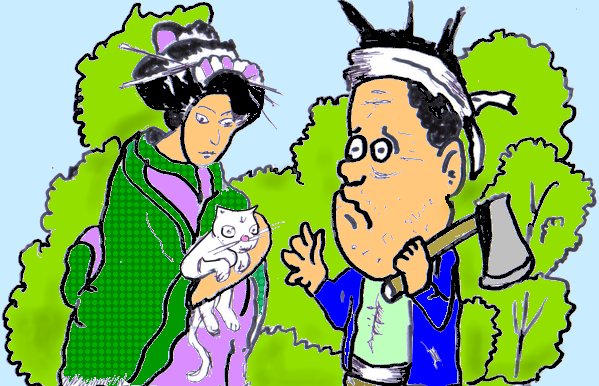 The kitten was named "Junotaro", which means "Tree boy" in Kanji. Junotaro thrived and grew up to a mischievous fighting boy. Once he has his eye on prey, he never lets it go. He became a boss cat who never loses in a battle over territory in the neighborhood. One day Junotaro overheard the lady talking with a neighbor. The lady : These days I have trouble with many roaches in my house. 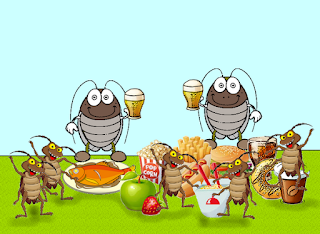 Roach motels become full houses easily. Neighbor : Your house too? Roaches visit my house one after another. So I can't live without Goki Jet. For now Goki Jet is the most powerful. Neighbor : Maybe...I think something is happening on Mt. Gokiga, where a roach boss lives. We had better do something there. The lady : Yes, I think so too... but I am wondering if there are any brave people who can go to Mt. Gokiga. What should we do? After their conversation, they looked serious and returned to their homes. "What's Goki Jet? Is there any more powerful man than me in the world? Okay, I'll show everyone that I AM the most powerful man! I am going to Mt. Gokiga!" Junotaro : Sir, Ma'am, I am going to Mt. Gokiga to get rid of roaches. The man : What are you thinking? That’s Impossible! That's a terrifying mountain! Junotaro : That's fine. You know, I am killing roaches around here, just like that. The lady : That's another story, Junotaro. I think tons of roaches should be on Mt. Gokiga. The man : She is right. Junotaro, you can't go there. I'll ask to the government to cope with the roach problem. Junotaro : Don't worry. I'm fine. I want to show that I AM the most powerful man in the world. The man : You are, Junotaro. Junotaro : More than Goki Jet? The lady : Oh? Goki Jet is a roach spray. It's a different type of 'the most powerful'. Junotaro : Oh, I didn't know that… but I have made up my mind! I'm going to clean up Mt. Gokiga! Junotaro was excited to go to Mt. Gokiga to get rid of roaches. Seeing Junotaro's unwavering determination, the couple sent him off praying for his safety. The lady gave Junotaro oil-cured kibinago fish, which he loves. "Junotaro, please be careful and come back safe and sound. Here’s, your favorite." "Thank you, ma'am. I will certainly beat out all roaches on Mt. Gokiga." Then Junotaro left for Mt. Gokiga. 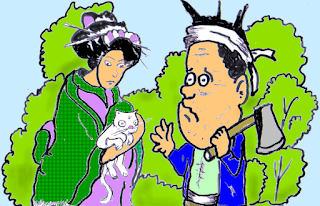 On the way, Junotaro saw Bluekichi, who is a handsome Siamese cat in neighborhood. Bluekichi : Hey Junotaro, where are you going? Junotaro : I'm going to Mt. Gokiga to get rid of roaches. Bluekich : It's brave of you to go there. But that sounds fun. I feel like showing my fast attack punch. I can go with you if you give me some of that kibinago fish. Junotaro : Sure. This is salty, so drink a lot of water. Junotaro gave one of the oil-cured kibinago fish to Bluekichi. 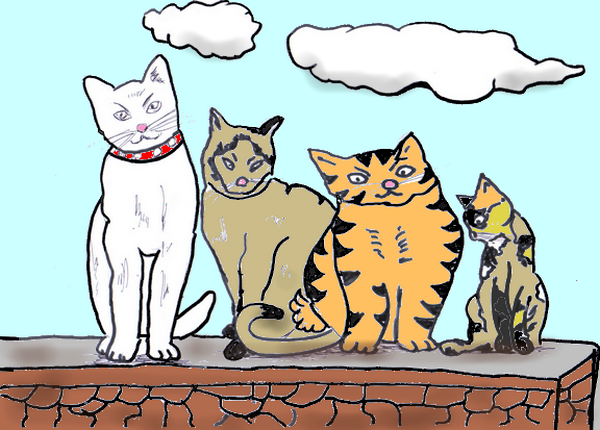 While Junotaro and Bluekichi were walking, a tortoiseshell cat Lalami, who is famous for beauty in neighborhood, talked to the boys. Lalami : Hello Junotaro, where are you going? Junotaro: Hey Lalami, you are always beautiful. I'm going to Mt. Gokiga to get rid of roaches. Lalami : That's amazing! You are so strong! Oh? What's that? Hanging from your shoulder…? Junotaro: This? This is oil-cured kibinago fish. Do you want to try? Lalami : Yes! Please! Whoopie! Lalami received one of the oil-cured kibinago fish from Junotaro and tasted it. Lalami : It's salty, but very good. Junotaro: Drink a lot of water. Here is your water. Lalami : Thank you, Junotaro... Can I go with you to get rid of roaches? Junotaro: It's dangerous for a girl. You shouldn't go there. Lalami : Well, you don't know about me. I am a master of using ropes. Junotaro: Oh I see… Now I understand why you are always running with ropes. Okay, you can come with me. "♫ Junotaro-san, Junotaro-san, give me one of those kibinyaaagoo, that is hanging from your shoulder♫"
Junotaro : What's wrong with you. Augisuke? You are in the way. Just go away. We are going to Mt. Gokiga to get rid of roaches. Augisuke : Oh God, you are really reckless. But I understand because you are unsurpassed in fighting. Well, I can go with you if you give me a pickled kibinago fish. Junotaro : This is anchovy, not pickled. Augisuke : No matter how you look at it, that’s kibinago fish, not anchovy. Junotaro : What are you talking about? This is ANCHOVY of kibinago fish! Augisuke : Huh? It doesn't make sense... A-ha, you don’t know anchovy is fish name, do you? Junotaro : Huff! I KNOW!! But Japanese people always call oil-cured fish...ANCHOVY! You are a very Japanese cat, but you don't know such a common thing, do you? Augisuke : Hehehe, you are really hot-blooded. You know, I love eating roaches and I can go with you if you give me an ANCHOVY. Junotaro : Okay, you might be helpful if it's true. Junotaro gave one of the oil-cured kibinago fish to Augisuke. When the troop reached Mt. Gokiga, they could hear many rustling sounds from behind the Gokiga gate. That must be moving sounds by many roaches. 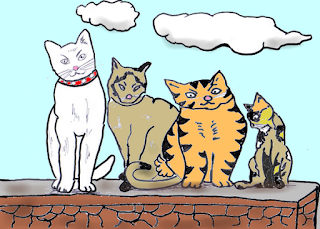 Junotaro and the other companions leaped on the wall and looked inside. 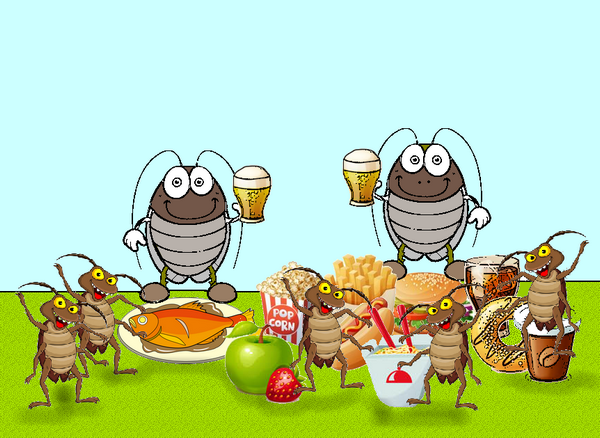 They saw a bunch of roaches live in luxury, having a huge feast and singing and dancing. "All that food is stolen from our village! I can't stand it!" Junotaro then splashed 78% alcohol sanitizer over the roaches. 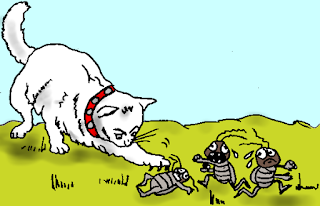 The roaches were shocked and panicked. They tried to flee, but the Junotaro team showed no mercy. Junotaro stuck the roaches with his claws one after another. Bluekichi never missed knocking down the roaches flying to run away. 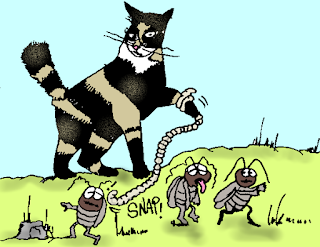 Lalami repeatedly lashed the roaches with her rope to squash them. Augisuke chased and ate the roaches from one to the next. Finally, they disposed of all the roaches in quick order. The clowder left Mt. Gokiga and returned to the village. In the village their brave feat had already made the headlines and they shot to fame. As Junotaro's wish, everyone in the world affirmed that Junotaro is the strongest man. 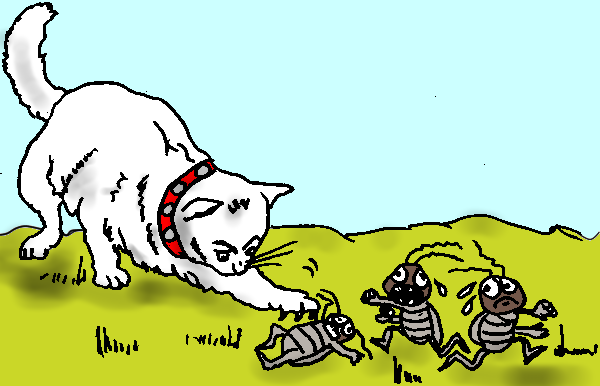 Then the inhabitants of the village lived in eternal peace without roaches' terrifying them ever after. February 20, 2017, I left for heaven at age 5 and 11 months. I’m in a tour around heaven. Daddy and mommy tell me to come back someday. I think about it. It’s unscheduled for a while, though. The paperwork for a reincarnation application is a kind of hard work. Also I never ever want to have a heart problem anymore! I suffered pain and struggled breathing hard last time. Well… actually I had chosen this disease and I was reincarnated as Juno because there has been a reason that I wanted to accomplish. 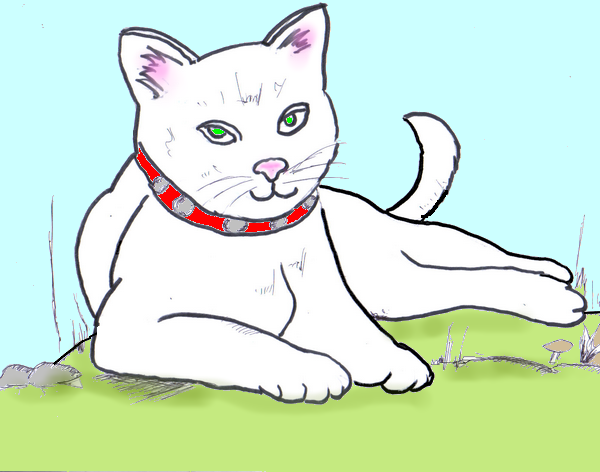 Before reincarnation, I was a female white cat named Kassandra. I will write about it when I am in the mood for it. Copyright (C) 2011-2018 Juno's Diary "Life through my eyes". Theme images by gaffera. Powered by Blogger.